Thanks again to +Jodi Whisenhunt, +Mike Ellis, and +Heidi's Head for co-hosting this funtastic trivia hop! A special crew of castmembers polish the brass poles on Prince Charming Regal Carrousel every night! Interested in more Carrousel trivia? 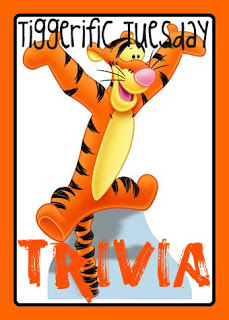 Check out this previous Tiggerific Tuesday Trivia! Awww, that's such a cute picture! Was that his first WDW visit? Great trivia today! That was his 2nd.. he's been 3 times since! He is a photogenic little crazy!